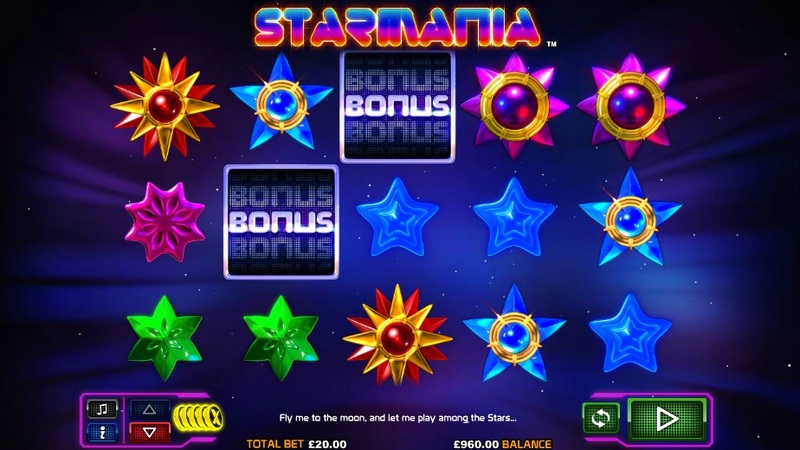 Space is often considered the final frontier and it therefore seems that creative slots developer NextGen Gaming have decided to venture forth to that said frontier for this new intergalactic slot called Starmania. 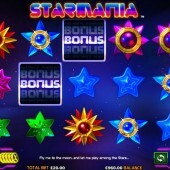 Starmania is a 5 reel, 10 payline slot and my immediate impression is that they are going for something that will likely trigger a feeling of nostalgia because everything from the graphics to the sounds on this slot feels like it is designed with a retro vibe. Basically, if you were born pre-1990 then this one could well be for you! The symbols on the reels include different types of stars. These aren't even realistic stars. They are more the sort of stars you might expect to find in a computer game. There is the yellow and red star, the purple and gold star, the green and gold star, the blue and gold star, the plain purple star, the plain green star, and the plain blue star. The Wild symbol is creatively represented by a Wild icon. It substitutes for all other symbols, except for the Scatters, to complete any potential winning combos that might be hit across the reels on a single spin. The Wilds only appear on reels 2, 3, and 4. The Scatters are present on the reels in the form of a Bonus icon. If you hit three or more of these symbols across the reels then you will trigger 10 free spins. Extra Stacked Wilds are also added to the reels for the duration of the free spins. These will all appear on reels 2, 3, and 4 as well. It is possible to re-trigger the free spins bonus round by hitting three or more Scatters on the reels during the free spins. Unfortunately, that is everything for this slot. I am generally a fan of NextGen Gaming slots with the frantic Foxin' Wins slot being one of my favourite slots of all time. Sadly, this slot is more like the sedate Butterflies slot. The free spins bonus round is the only bonus feature and despite the Extra Stacked Wilds being introduced I still found it difficult to get any big wins. That was when I even triggered the bonus feature. This slot was long spells of nothingness and I found that very frustrating. I've come to expect better from NextGen so the disappointment was even deeper for that reason.